Cadence Point is a intimate 31-home development located just minutes from downtown Brevard, North Carolina; one of America's famous small towns. Cadence Point, like Brevard manages the crafty procedure of honoring the past while looking forward at the same time. On one hand, Cadence Point is reminiscent of a classic neighborhood, with its inviting streetscape and homes that recreate a sense of Brevard’s architectural legacy. On the other, the entire community is designed for modern living, with a strong emphasis on sustainability. Cadence Point has been selling like hotcakes, so if sold out search our other Brevard properties for sale. Cadence Point is located inside city limits so one can easily take advantage of existing parks, infrastructure and resources, instead of having to subsidize new ones in a suburban development. Walk to your favorite restaurant or enjoy an evening shopping in one of Brevard's unique boutiques. 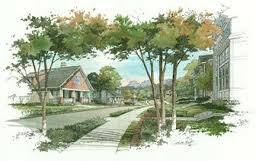 In this community you will experience small town living with big town opportunities.